Paradigm is located at Cygnet Park, Hampton, close to Junction 3 of the A1139 dual carriageway. It is 1.5 miles (2.4k) east of Junction 17 of the A1(M) providing excellent logistical links to the rest of the UK including all east coast ports. Peterborough City centre is also conveniently located within a 7 minute drive. Paradigm is accessed via Club Way off the A15 London Road just minutes from Junction 3 of the A1139. The area is rapidly establishing itself as the new employment and business park of the city and a number of development schemes have already been completed. Occupiers in the immediate vicinity include News International, Deaf Blind UK, Halcrow, Clydesdale Bank and Premier Kitchens & Bedrooms. The development is in close proximity to the new Serpentine Green Shopping Centre, the location of Tesco Extra as well as a number of household names including Gap, Next, Boots, WH Smith, H&M and Brantano. A pub and hotel development lie adjacent to the shopping centre with a David Lloyd Tennis Centre to be constructed. 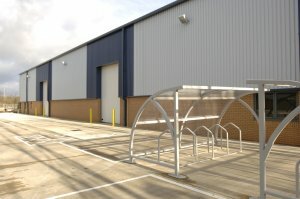 The units are available on either a freehold or leasehold basis, on terms by negotiation.